We are making a wooden pentacle today…. Okay, so the big silver pendant with the dragon and the giant amethyst is really pretty. Do you have to have it? Is it something you can’t live without? Chances are that if you step aside for a while, and take some time to think about your purchase, you’ll realize that the money spent on that pendant might be better used somewhere else. Don’t buy things that aren’t essential — and a good way to avoid buying stuff you don’t need is to train yourself not to impulse buy. If you go into your favorite Witchy Shoppe to buy one book, don’t come out with three just because some of them were on sale. Buy what you need, and no more. If you really need the other items, you can go back and get them later, once you’ve thought about it. 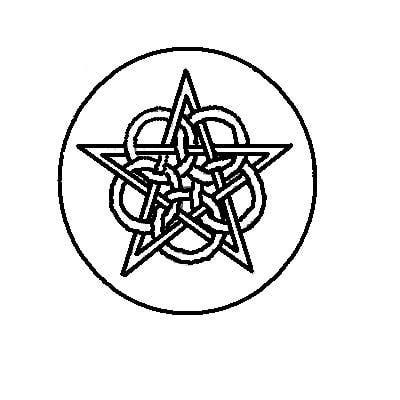 The pentacle is one of the most commonly used magical tools in the Wiccan religion, as well as in some traditions of Paganism. Typically, it is used on the altar as a place to hold items that are about to be ritually consecrated or charged. In some traditions, the pent represents the element of Earth. There are many absolutely beautiful pentacles available commercially, made of wood, tile, metal, ceramic, and just about every other type of material. If you’re operating on a budget, however, or if you just like the idea of handcrafting your own magical tools, it’s not hard to make a pentacle of your own. You’ll need a wooden disc in the size of your choice, available at nearly any hardware or craft store. The one in the photo is a 7″ circle, and cost less than $3.00. 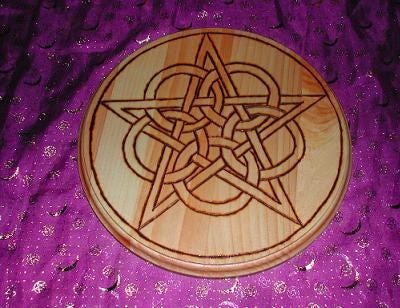 You’ll also need to decide whether you want to paint your pentacle pattern, or burn it into the wood. The one in the photo is burned on, using a woodburning pen that I bought for $2.00 at a craft store. Finally, you’ll need some clear polyeurethane and a brush. First, print out the image above. Use a copy machine with resizing capabilities to either enlarge or shrink the image, depending on the size of your wooden disc. Once you have it the size you want, place it on top of the wooden disc. Using a pencil, trace over the outline of the pattern, pressing down so that you make an indentation in the wood. Once the design is indented, use the pencil to go back over the indents, making a complete pencilled pattern on the wood. If you’re painting, use your paints to go over the pencil lines. If you’re using a woodburning pen, carefully trace over the lines — depending on how experienced you are with woodburning, it may take a couple of hours. When you’re done, brush a few coats of polyeurethane over the design to give it some shine and to protect it from wear. If you like, use a small drill bit to make a hole in the center for incense sticks. Finally, if you’re concerned that your pent might scratch your altar top, cut out a circle of felt the same size as the wooden disc, and glue it to the bottom of the wood. Use your pentacle on your altar to consecrate ritual items, to bless or charge talismans, or to represent the element of Earth. Alternately, you could attach a hook to the back and hang it on your wall.